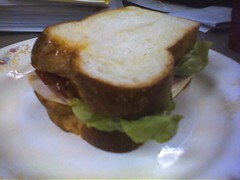 Turkey & Salami Sandwich w/ Tomato Marmalade – Jay Luker – Really? ... Wow. I made some Tomato Marmalade last week but haven’t had many things that it seemed appropriate to put it on. I had the notion that it would be good on a sandwich with salami and red onion… and wah-lah [sic]. Challah bread from Hi-Rise. Bibb lettuce and red onion from the farmer’s market. A slice of roasted turkey breast and a couple of slices of hard salami. Swiss cheese. A slathering of Tomato Marmalade.